Would you use “Facebook at Work” as your corporate social network? Home / collaboration / Would you use “Facebook at Work” as your corporate social network? 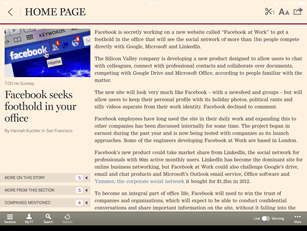 I was reading an interesting article in the Financial Times this morning (registration required) about the fact that Facebook is apparently developing a corporate version called “Facebook at work”. It got me thinking, as I spend most of my professional time now convincing corporates that that they should be using an enterprise social network to collaborate, would I use (and trust) Facebook for my enterprise collaboration? There are a number of existing enterprise-grade social networks such as IBM’s own IBM Connections (free trial here), Microsoft’s Yammer, Salesforce’s Chatter, and Jive. All of these existing solutions offer a variety of features, from full file-sharing, document management and collaboration, through to communities, and real-time chat. Many of these solutions can be hosted in the cloud, and some can also be hosted securely “on premise”, providing CIOs peace of mind that sensitive corporate data is secure on the company’s own network. Now I’ve got my corporate social network, what next? The issue I find my clients struggle with, regardless of the platform is how do you drive adoption? It is all very well to have rolled out a brand new corporate social network, but you need users to actually want to use it – and this requires a cultural change. Cultural change is hard, so how do you encourage people to change their behaviour and share what they are doing? “..ten (or 20) years ago, If I said to you that you had to carry a piece of plastic (a mobile phone) with you everywhere you went, and be available for calls on the weekend, you probably would have asked me what additional pay I would receive as a result”. The thing is, in 2014. when we join a new company, one of the first things we ask about is our mobile phone. We need to get corporate social networks to the same “mobile phone” moment where everyone is asking about access to the network, and if we took it away, there would be a riot. How would you separate Facebook from FB@Work? So back to the FT article, where they hint that the new Facebook network is aimed to compete with existing networks such as LinkedIn and Google Docs. I am not sure I would want to use the same network for both personal and business use, and given Facebook is driven by advertising, could we be assured that I would not see advertisements for the latest top secret deal I am working on alongside my posts? I am also not sure that a FB@Work would compete directly with networks such as LinkedIn. LinkedIn woks well as a directory of contacts, and also surfaces great business-related content from my contacts. While I am sure LinkedIn is looking at how they might expand the site beyond being an excellent directory, the issue of adoption remains, and this is of course where companies such as IBM excel at taking an existing network, and developing processes to ensure they are properly adopted. How do you become a social organisation? Below you can see a video that explains how IBM Interactive Experience social collaboration experts designed a program and process to help 320,000 Tesco Colleagues communicate, collaborate and reward great work in real-time right across the country using Yammer. What we did at Tesco was a year-long project and required more than just training people on how to use the platform, as in every implementation, the focus needs to be on the cultural changes, not just the technology. This will be something I focus on in an upcoming blog post. I will be watching how the FB@Work progress progresses, and see if larger, more risk-averse organisations take to it, or it remains the “free” model for small and medium companies. On knowing, sharing, cultural change. Great article by @AndrewGrill http://t.co/ts6rChkzD9 Thrill & chills at finding someone new to follow!